Hypnotist Event Planners are saying . .
your show was the most popular event held in our Event Center since its inception. Our staff found you and Kelly Jean to be gracious and a pleasure to work with. Wouldn't believe it unless I seen it. Never Laughed so hard. A good night out. A good time for the price. Everything was great. Stage hypnotism demonstrates the power of focus and involves audience participation. Hypnotized volunteers receive powerful suggestions upon emerging from hypnosis. Results - greater energy, enhances focus and leave participants with a heightened sense of awareness. Bruce James interacts with audience participants in the trance state demonstrating heightened states of awareness. Standing room only crowd is amazed and inspired by the demonstrations of the comedy hypnosis show. 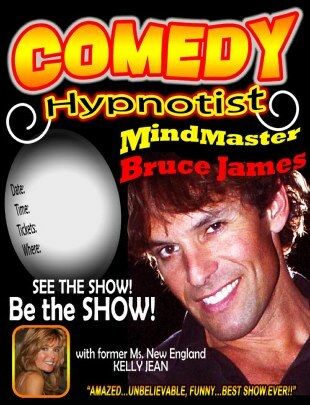 Assistant, former Miss New England Kelly Jean helps Comedy Stage Hypnotist Bruce James to focus on his volunteers while she effectively takes care of stage props and music. 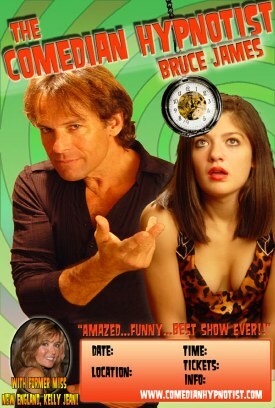 Raving audience reviews reflect the success of the comedy stage hypnotism show for events ranging from high school fundraisers, corporate comedy events or high school safe grad party events. 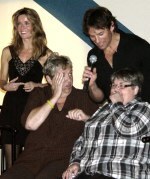 The stage hypnosis show allows volunteers to be the stars of the show. Some volunteer interviewed afterwards feel the freedom of the spirit and typically sleep better, have more energy and confidence. Some participants have quit smoking during a stage hypnosis induction. Stage hypnotism involves a live stage induction to hypnotize volunteers. What Entertainment Event Planners are saying . . .
Hi, Bruce! The hypnosis show was absolutely fantastic. and to make sure everyone was comfortable with the hypnotic show. You are great to work with and you and Kelly are fantastic with a crowd. and I'm now a big fan of your show. Thanks again! Thank you and we look forward to entertaining at your event!